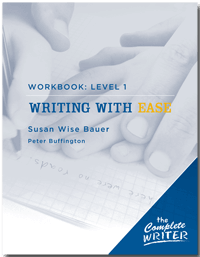 The Level 1 Workbook provides every copywork assignment, comprehension question, and reading passage that you’ll need for a full year of writing study. Using passages and sentences from classic children’s literature, the Level 1 Workbook allows young writers to practice their skills while absorbing the style and grace of great authors. Charming illustrations by Jeff West add a visual element that will spark your child’s imagination. Take the tears out of writing…use Writing With Ease! Curious about the purpose of elementary writing instruction? Be sure to listen to Susan’s audio lecture on the subject–one of our most popular downloads! See Susan’s updated grade recommendations here. Your purchase of this PDF is for your own personal use. You may not copy it either for resale or to give away to others. Making copies, either for resale or to give away, is a violation of United States law. According to the United States Copyright Office, “Copyright infringement occurs when a copyrighted work is reproduced, distributed, performed, publicly displayed, or made into a derivative work without the permission of the copyright owner.” For further information, see http://www.copyright.gov/help/faq/faq-definitions.html. What is recommenced for preschool and k-5 writing? Learning to write ABC’s, words, handwriting, etc. There are two different programs we recommend: Handwriting Without Tears (starting with “Letters and Numbers for Me”), and Zaner-Bloser (starting with “Grade K”). How many weeks of lessons is included? The way you have been doing it sounds good to us, and should work! Hi! My son is almost 6 and has learnt quite a bit of writing at reception in the UK. Do you think I could start with level 1 or is it too early? It might be all right…try the first few lessons and see. But there is no hurry. Take lots of breaks and keep the lessons brief. Are the student pages included in the this book or do I need to purchase them separately? Thank you! Yes, the student pages are included in this book. If you want an extra set of the student pages (say, for a second student) you can purchase those separately. I want to use this workbook for my twins. Just want to double check that if I buy the pdf I can just print two copies of everything rather than buying the hard copy workbook plus a set of the student pages. All the questions below seem to be about hard copies. Yes! If you buy the PDF, you can print as many copies as you need for your family. I have purchased/used these books for my two older children and we love them. I only have one issue, hence the four star rating. When I print the kids worksheets for the week I always have to go back into my pdf versions in order to tell which set came from which book. Would it be possible to put something like WWE-1, WWE-2 etc in the footers of the pages so it is easier to tell which is which. PLEASE!!! We recently moved and a bunch of these pages were combined into one box, it has been a nightmare sorting them out. Also as another poster mentioned the printed pages are smaller than in the physical books, looks like bigger margins are being used for the pdf versions. Thanks for this! We’ll take a look at this suggestion and see what we can do the next time we reprint the book. What age/grade is this for? Thanks. Ideally for a 7 or 8 year old student. Thanks for checking. Yes, that sale ended on Sunday, unfortunately. There won’t be another sale on Grammar products very soon. Are the student pages single sided or double sided in the loose leaf copy? I’m trying to decide how to print out my PDF version. The pages are single sided. This will be the first year that I am using this with my kids. How do I know which level they should start with? I have 3rd, 4th, 6th, and 8th graders. Thanks! Does the workbook include the copywork and narration exercise for every week? For example, with the combined years 1-3 textbook I have, certain weeks are chosen by the teacher. Does the teacher choose them for the workbook, or are they provided? The workbook includes copywork and narration exercises for every week. It’s all provided! I homeschool two children. If I get the WWE Instructor Manual and two sets of the Student Pages will I have enough material to teach the program. I anticipate some potential conflict between the kids if one gets an activity book and the other loose leaf pages. If you get the Student Pages for Workbook 1 without getting a copy of Workbook 1, you’ll be missing a lot of the assignments. The Student Pages assume that you have Workbook 1. If you’re looking for an economical solution, you could get each child their own copy of Workbook 1 from our “Scratch & Dent” sale. These books have very mild marking or scratches on the covers, but are otherwise completely intact, and we sell them for 60% less than the cover price! Call our office at 1.877.322.3445 to order them. Do we need both the workbook AND the teacher’s guide? Also, what is the difference between the workbook and the student looseleaf pages? Yes, it’s best to have both the workbook and the teacher’s guide. There is some overlap, but the teacher’s guide has a lot of helpful “why” and troubleshooting material. The workbook contains instructions AND all the pages the student will need. The looseleaf pack is ONLY the student pages; no instructions. Pick up a looseleaf pack for additional students; that way you don’t have to buy them a whole other book. I love this series. I think it is perfect. I have taught Level 1 to a first grader and Level 2 to a second grader. I was able to tailor the lessons to a child who was strong-willed, struggled with handwriting, and was too anxious to think up and write out a complete sentence. I love that the daily time commitment is short – for instructor and student. I love that it is so well thought out and gradual in building skill and confidence. I loved that I had to do no lesson planning; I just got the worksheets out for that day, sat on the couch with my daughter (while I nursed a newborn), and we were able to complete the lesson in about 10-20 minutes (depending on student cooperation and toddler & baby interruptions). After a year off from homeschooling, I look forward to teaching Writing With Ease again this year! I have a 7 (turning 8) year old going into second grade. This would be our first time using this curriculum. I know she would be in Level 1 with WWE, but what level would pair best in FLL? She does already know about most parts of speech and sentence structure, should I start her at level 2 in FLL? Start with Level 1, but you can move quickly through the early lessons, since some of it will be review. Also, if you’re using WWE and FLL at the same time, you can skip any of the exercises in FLL that are called “Story Narration” or “Poem Narration,” since she’ll be getting plenty of that in WWE. I see from a previous question that the diagnostic test is the best way to determine which WWE book to use for my rising 5th grader. Could you tell me where that link is located on the site? Also, I am considering switching from IEW History-Based Writing Lessons to this curriculum. Can you tell me how they are similar/different? Our program doesn’t add in the “creative writing” side like I.E.W. does, since we treat that as its own subject.